CAMPAIGNING for a second term as Brazil’s president in an election last October, Dilma Rousseff painted a rosy picture of the world’s seventh-biggest economy. Full employment, rising wages and social benefits were threatened only by the nefarious neoliberal plans of her opponents, she claimed. Just two months into her new term, Brazilians are realising that they were sold a false prospectus. Brazil’s economy is in a mess, with far bigger problems than the government will admit or investors seem to register. The torpid stagnation into which it fell in 2013 is becoming a full-blown—and probably prolonged—recession, as high inflation squeezes wages and consumers’ debt payments rise (see article). Investment, already down by 8% from a year ago, could fall much further. A vast corruption scandal at Petrobras, the state-controlled oil giant, has ensnared several of the country’s biggest construction firms and paralysed capital spending in swathes of the economy, at least until the prosecutors and auditors have done their work. The real has fallen by 30% against the dollar since May 2013: a necessary shift, but one that adds to the burden of the $40 billion in foreign debt owed by Brazilian companies that falls due this year. Escaping this quagmire would be hard even with strong political leadership. Ms Rousseff, however, is weak. She won the election by the narrowest of margins. Already, her political base is crumbling. According to Datafolha, a pollster, her approval rating fell from 42% in December to 23% this month. She has been hurt both by the deteriorating economy and by the Petrobras scandal, which involves allegations of kickbacks of at least $1 billion, funnelled to politicians in her Workers’ Party (PT) and its coalition partners. For much of the relevant period Ms Rousseff chaired Petrobras’s board. If Brazil is to salvage some benefits from her second term, then she needs to take the country in an entirely new direction. 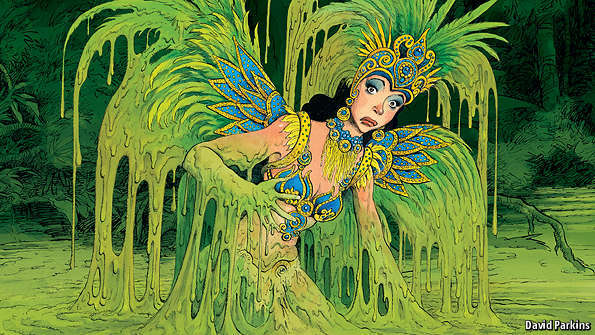 Brazil’s problems are largely self-inflicted. In her first term Ms Rousseff espoused a tropical state-capitalism that involved fiscal laxity, opaque public accounts, competitiveness-sapping industrial policy (see article) and presidential meddling in monetary policy. Last year her re-election campaign saw a doubling of the fiscal deficit, to 6.75% of GDP. To her credit, Ms Rousseff has at least recognised that Brazil needs more business-friendly policies if it is to retain its investment-grade credit rating and return to growth. This realisation is personified by her new finance minister, Joaquim Levy, a Chicago-trained economist and banker and one of the country’s rare economic liberals (see article). However, Brazil’s past failure to deal promptly with macroeconomic distortions has left Mr Levy to grapple with a recessionary trap. To stabilise gross public debt, he has promised a whopping fiscal squeeze of almost two percentage points of GDP this year. Part of this is coming from the removal of an electricity subsidy and the reimposition of fuel duty. Both measures have helped to push inflation to 7.4%. He also plans to curb subsidised lending by public banks to favoured sectors and firms. Ideally, Brazil would offset this fiscal squeeze with looser monetary policy. But because of the country’s hyperinflationary past, as well as more recent mistakes—the Central Bank bent to the president’s will, ignored its inflation target and foolishly slashed its benchmark rate in 2011-12—the room for manoeuvre today is limited. With inflation still above its target, the Central Bank cannot cut its benchmark rate from today’s level of 12.25% without risking further loss of credibility and sapping investor confidence. A fiscal squeeze and high interest rates spell pain for Brazilian firms and households and a slower return to growth. What makes this adjustment perilous is the political fragility of Ms Rousseff herself. On paper she won a comfortable, though reduced, legislative majority in the October election. Yet the PT is already grumbling about Mr Levy’s fiscal policies—partly because the campaign did not lay the ground for them. Ms Rousseff suffered a crushing defeat on February 1st in an election for the politically powerful post of head of the lower house of Congress. Eduardo Cunha, who vanquished the PT’s man, will pursue his own agenda, not hers. Not for the first time, Brazil may be in for a period of semi-parliamentary government. The country thus faces its biggest test since the early 1990s. The risks are clear. Recession and falling tax revenue may undermine Mr Levy’s adjustment. Any backsliding may in turn prompt a run on the real and a downgrade in Brazil’s credit rating, raising the cost of financing for government and companies alike. Were Brazil to see a repeat of the mass demonstrations of 2013 against corruption and poor public services, Ms Rousseff might be doomed. Yet the president’s weakness is also an opportunity—and for Mr Levy in particular. He is now indispensable. He should build bridges to Mr Cunha, while making it clear that if Congress tries to extract a budgetary price for its support, that will lead to cuts elsewhere. The recovery of fiscal responsibility must be lasting for business confidence and investment to return. But the sooner the fiscal adjustment sticks, the sooner the Central Bank can start cutting interest rates. More is needed for Brazil to return to rapid and sustained growth. It may be too much to expect Ms Rousseff to overhaul the archaic labour laws that have helped to throttle productivity, but she should at least try to simplify taxes and cut mindless red tape. There are tentative signs that the government will scale back industrial policy and encourage more international trade in what remains an over-protected economy. Brazil is not the only member of the BRICS quintet of large emerging economies to be in trouble. Russia’s economy, in particular, has been battered by war, sanctions and dependence on oil. For all its problems, Brazil is not in as big a mess as Russia. It has a large and diversified private sector and robust democratic institutions. But its woes go deeper than many realise. The time to put them right is now. 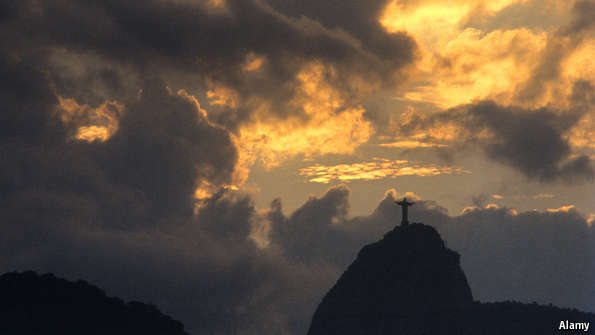 IT IS easy for a visitor to Rio to feel that nothing is amiss in Brazil. The middle classes certainly know how to live: with Copacabana and Ipanema just minutes from the main business districts a game of volleyball or a surf starts the day. Hedge-fund offices look out over botanical gardens and up to verdant mountains. But stray from comfortable districts and the sheen fades quickly. Favelas plagued by poverty and violence cling to the foothills. So it is with Brazil’s economy: the harder you stare, the worse it looks. Brazil has seen sharp ups and downs in the past 25 years. In the early 1990s inflation rose above 2,000%; it was only banished when a new currency was introduced in 1994. By the turn of the century Brazil’s deficits had mired it in debt, forcing an IMF rescue in 2002. But then the woes vanished. Brazil became a titan of growth, expanding at 4% a year between 2002 and 2008 as exports of iron, oil and sugar boomed and domestic consumption gave an additional kick. Now Brazil is back in trouble. Growth has averaged just 1.3% over the past four years. A poll of 100 economists conducted by the Central Bank of Brazil suggests a 0.5% contraction this year followed by 1.5% growth in 2016. Both elements of that prediction—the mild downturn and the quick rebound—look optimistic. The prospects for private consumption, which accounted for around 50% of GDP growth over the past ten years, are rotten. With inflation above 7%, shoppers’ purchasing power is being eroded. Hefty price rises will continue. Brazil is facing an acute water shortage; since three-quarters of its electricity comes from hydroelectric dams, this is sapping it of energy. To avoid blackouts the government plans to deter use by raising prices: rates will increase by up to 30% this year. With the real losing 10% of its value against the dollar in the past month alone, rising import prices will bring more inflation. There is little hope of disposable income keeping pace. 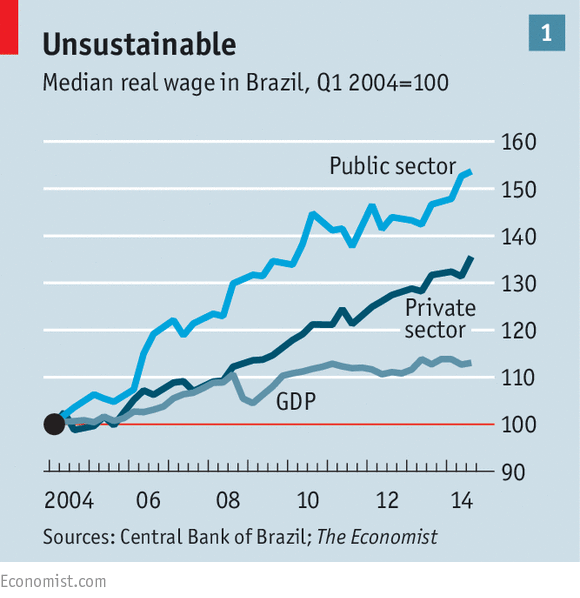 One reason is that Brazilian workers’ productivity does not justify further rises. In the past ten years wages in the private sector have grown faster than GDP; cosseted public-sector workers have done even better (see chart 1). Since Brazil’s minimum wage is indexed to GDP and inflation, a recession will freeze real pay for the millions who earn it. Austerity will bite, too, as Brazil’s new finance minister, Joaquim Levy, tries to balance the books. Higher taxes on fuel are being phased in, a blow for a car-loving country. If Mr Levy reforms the generous state pension, the incomes of older Brazilians will stall. Debt payments add to the woes. Total credit to the private sector has jumped from 25% of GDP to 55% in the past ten years. With total household debt at around 46% of disposable income, Brazilian households are much less indebted than those in Italy or Japan. Yet the price of this borrowing is sky-high. Four-fifths of it is punishingly costly consumer credit (the average rate on new lending is 27%, according to the Central Bank). Once hefty principal payments are added in, debt service takes up 21% of disposable income. With the economy slowing and the Central Bank reluctant to cut interest rates because of high inflation, consumers will feel the pinch, says Arthur Carvalho of Morgan Stanley. On February 25th a survey put consumer confidence at a ten-year low. There are few compensating sources of demand. 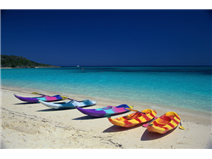 Investment, which rose in eight of the ten years to 2013, often substantially, will sink in 2015. Petrobras, the partially state-owned oil giant that is Brazil’s largest investor, is mired in a corruption scandal that has paralysed spending: the affair may cost up to 1% of GDP in forgone investment. On February 24th Moody’s, a credit-rating agency, cut its debt to junk status; if Petrobras fails to publish audited results soon it may be unable to borrow at all. Exporting is no answer, despite the falling real. Five countries—China, America, Argentina, the Netherlands and Germany—buy 45% of Brazil’s exports. Ten years ago these economies’ average GDP growth, weighted by their heft in Brazilian trade, was 12%; this year 5% would be good. Yet the biggest worry is not that Brazil has a bad year, but that its broken policy levers mean that it gets stuck in a rut. Brazil spent 311.4 billion reais (6% of GDP) on interest payments in 2014, a 25% increase on 2013. This means that even if Mr Levy’s fiscal drive works—he is aiming for a primary surplus of 1.2% of GDP—Brazil will be nowhere near the black. The state’s outgoings have proved hard to control, with benefits payments rising despite falling unemployment. In a recession it will be harder still. Brazil’s parlous finances leave no room for debt-financed stimulus. At 66% of GDP its gross public debt is the highest of the BRIC countries. Its bonds yield 13%—more than Russia’s. Rates could rise further. Fitch, a credit-rating agency, puts Brazil one notch above junk, but it has more debt, bigger deficits and higher interest rates than most countries in that category. If growth evaporates, a downgrade would be a certainty, raising debt costs even more. 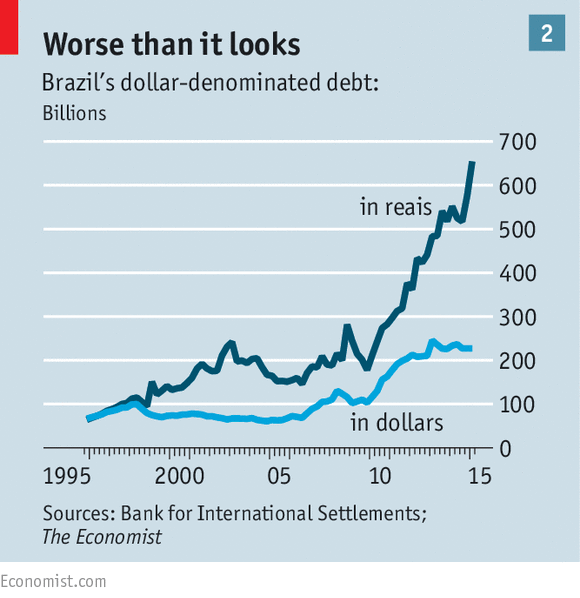 Such predicaments are not uncommon, but Brazil’s monetary problems are. The governor of the Central Bank, Alexandre Tombini, must choose between two nasty paths. The first is a hard-money approach: keeping interest rates high despite the weak economy. This would prop up the real and boost the bank’s inflation-bashing credentials. But it is not just households that are hurt by high rates; firms are, too. In aggregate the big Brazilian firms Fitch rates have had negative cashflow since 2010. They have plugged the gap by running down savings and issuing debt. Borrowing is up by 23% in five years. With the risk of default rising, a fifth of these firms face a downgrade, in many cases imminent. In reality, a tough monetary stance would have to be softened by an extension of Brazil’s lavish financial subsidies. State-owned banks like BNDES, a development bank, and Caixa Econômica Federal, a retail one, made 35% of loans in 2009. Today their share is 55%. Since many Brazilian firms cannot pay private market rates (the average rate for new corporate loans is 16%) BNDES lends at a concessionary rate, currently 5.5%. That makes banking in Brazil a fiscal operation, says Mansueto Almeida, an expert on the public finances. The funding comes from the state, which borrows at a much higher rate than firms pay. The difference, a loss, is borne by taxpayers. The alternative path for Mr Tombini to go down is to cut rates despite rising inflation—a daring move given Brazil’s history. The cause of price increases, after all, is not an overheating economy, but the real’s fall, rising taxes and the drought. The textbook response would be to “see through”—ie, ignore—this inflation. But soft money would hurt, too. It would cause the real to fall further, and thus accelerate increases in the prices of imported goods. Foreign debts, which Brazilian firms and local governments have accumulated due to the lower interest rates on offer, would become harder to bear. Data collected by the Bank for International Settlements show dollar debts rising from $100 billion to $250 billion over the past five years. But the burden in local-currency terms has jumped much more, from around 210 billion reais to 655 billion reais (see chart 2). The state lends a hand here too, with the central bank offering swap contracts to insure firms against a falling real. The scheme cost the bank 38 billion reais in the second half of last year alone. Faced with these poisonous options, a middle path is most likely. Interest rates will be too high for households and firms, so subsidised funding will grow. But they will be too low to protect the real, so swap costs will rise, too. Both subsidies put extra pressure on the government’s finances. By mixing monetary and fiscal policy in this way, Brazil is slowly rendering both ineffective. In an economy heading for recession, that is not a good place to be. BRAZILIANS make up almost 3% of the planet’s population and produce about 3% of its output. Yet of the firms in Fortune magazine’s 2014 “Global 500” ranking of the biggest companies by revenue only seven, or 1.4%, were from Brazil, down from eight in 2013. And on Forbes’s list of the 2,000 most highly valued firms worldwide just 25, or 1.3%, were Brazilian. The country’s biggest corporate “star”, Petrobras, is mired in scandals, its debt downgraded to junk status. In 1974 Edmar Bacha, an economist, described its economy as “Belindia”, a Belgium-sized island of prosperity in a sea of India-like poverty. Since then Brazil has done far better than India in alleviating poverty, but in business terms it still has a Belindia problem: a handful of world-class enterprises in a sea of poorly run ones. Brazilian businesses face a litany of obstacles: bureaucracy, complex tax rules, shoddy infrastructure and a shortage of skilled workers—to say nothing of a stagnant economy (see article). But a big reason for Brazilian firms’ underperformance is less well rehearsed: poor management. Since 2004 John van Reenen of the London School of Economics and his colleagues have surveyed 11,300 midsized firms in 34 countries, grading them on a five-point scale based on how well they monitor their operations, set targets and reward performance. Brazilian firms’ average score, at 2.7, is similar to that of China’s and a bit above that of India’s. But Brazil ranks below Chile (2.8) and Mexico (2.9); America leads the pack with 3.3. The best Brazilian firms score as well as the best American ones, but its long tail of badly run ones is fatter. Part of the explanation is that medium and large firms tend to be better-organised than small ones, and not only because well-run ones are likelier to grow. Brazil offers incentives aplenty to stay bitty, such as preferential tax treatment for firms with a turnover of no more than 3.6m reais ($1.3m). As they expand, many firms split rather than face increased scrutiny from the taxman. According to the World Bank, a midsized Brazilian firm spends 2,600 hours filing taxes each year. In Mexico, it is 330 hours. Ownership patterns play a part too. 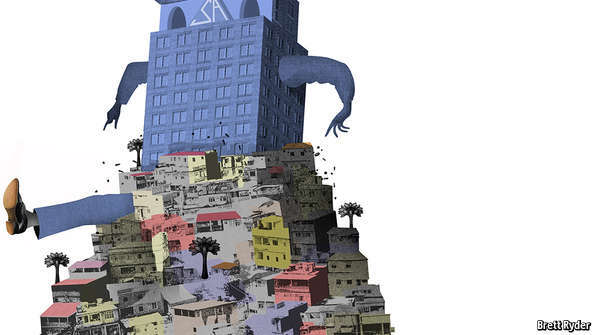 Many Brazilian concerns are controlled by an individual shareholder, or one or two families. Two-thirds of those with sales of more than $1 billion a year are family-owned, notes Heinz-Peter Elstrodt of McKinsey, a consulting firm. That is less than in Mexico (96%) or South Korea (84%) but more than in America or Europe. Mr Van Reenen’s research shows that where family owners plump for outside chief executives, their firms do no worse than similarly sized ones with more diverse shareholders. But all too often they pick kin over professional managers—and performance suffers. This is particularly true in “low-trust” societies like Brazil, where bosses hire relatives instead of better-qualified strangers to avoid being robbed or sued for falling foul of overly worker-friendly labour laws. Decades of economic turmoil—which ended when hyperinflation was vanquished in 1994—meant that companies were managed from crisis to crisis. This forced Brazilian firms to be nimble. But it also encouraged short-termism, which management consultants and academics finger as Brazilian managers’ number-one sin. Faced with a record drought in 2014, and a subsequent spike in energy prices in a hydropower-dependent country, Usiminas, a steelmaker, stopped smelting and started selling power it had bought on cheap long-term contracts. Energy sales made up most of its operating profits that year. Such short-term stunts are hardly the path to long-term greatness. Worse, crisis management all too often consists of going cap in hand to the government. Brazilian bosses continue to waste hours in meetings with politicians that could be better spent improving their businesses. In January 2014, as vehicle sales flagged, the automotive industry’s reflex reaction was to descend on the capital, Brasília, and demand an extension of its costly tax breaks. Thanks to lifelines cast by the state, feeble firms stay afloat rather than sink and make room for more agile competitors. Shielded from competition by tariffs, subsidies and local-content rules, they have little reason to innovate. A locally invented gizmo which lets cars run on both petrol and biodiesel is nifty. But, asks Marcos Lisboa of Insper, a business school, does that really justify six decades of public support for the motor industry? Indeed, a glance at the “Belgian” end of Brazil’s corporate landscape suggests that successful firms cluster in sectors the state has not tried desperately to help, such as retail or finance. Bradesco, a big lender, is internationally praised as a pioneer of automated banking. Each month Arezzo creates 1,000 new models of women’s shoes, and picks 170-odd to sell in its shops. Brazil’s other world-beaters are in industries like agriculture and aerospace, which are free to compete at home and abroad, and in which the government sticks to its proper role. In 1990 farms were allowed to consolidate and to buy foreign machines, pesticides and fertiliser. Efforts by Brazil’s trade negotiators opened up export markets. JBS, a meat giant, can slaughter 100,000 head of cattle a day, selling more beef than any rival worldwide. Thanks in part to Embrapa, the national agriculture-research agency, Brazilian farms have been raising productivity by about 4% a year for two decades. Similarly, a supply of skilled engineers and know-how from the government’s Technological Institute of Aeronautics has helped turn Embraer, privatised in 1994, into one of the world’s most successful aircraft-makers. The success of businesses such as these offers a lesson for the state. The best way to make Brazil’s underperforming firms more competitive would be to make them compete more. Coddling by the state can be more a curse than a blessing. Ronald Reagan’s dictum that the nine most terrifying words in the English language are, “I’m from the government and I’m here to help,” translates well into Flemish, Hindi and Brazilian Portuguese.